In this article we propose to do a set of experiments with the simple signal generator models as well as with some algorithms of simple but effective processing of the derived signals. The noise signal has the wide spectrum. Therefore, its use helps to estimate the frequency response of the system. The noise is added to the testing signal to estimate the filtering property of the system. Consider we input the special form signal to the system. Then this system is valued as good one when the output signal follows the form of the input one. Here we consider the description of the special form generator Gen and Gauss noise generator Gauss_Gen. We do here a set of experiments using the network in the Fig.1. The other units in the Fig. 1 are statistical analysis unit S_Distribut, and averaging unit Averager. The Gauss noise generator is based on the central limit theorem of the statistics. Due to the theorem, if the probable datum is the sum of a set of N independent probable data then this sum has the binomial distribution, which approaches to the Gauss, or normal distribution. The Gauss noise generator described by VHDL looks like the following. Unit Gauss_Gen has two parts. The first one has nn parallel uniform noise generators. The data uniformly distributed at the interval [0.0,1.0] are generated by the congruent algorithm, which is performed by the procedure UNIFORM. The second part is an adder, which adds nn generated random numbers. The sum is divided by nn and adjusted to the interval [-1.0,1.0]. The figure nn is the generic variable. By nn = 1 the generator generates the uniform noise, by nn = 2 it generates the triangle distribution noise, and by nn > 10 the output signal is practically the Gauss noise. The signals from the generators Gen and Gauss_Gen are added in the adder SM after multiplication them to the scale factors mа, mb, respectively. As a result, we get the complex signal х(n), which we will test. The scaling adder model is the following. When we build the histogram of the signal х(n) probability distribution then its statistical properties can be estimated. The histogram calculation is implemented as the following. The value (n) representation interval, say, а < х(n) < b, is divided to k subintervals of equal length. і-th subinterval as well as 0-th subinterval х(n) < а and k+1 –th one b < х(n), responses to the natural number Мі,. This number is equal to the number of samples х(n), which enter the respective i-th subinterval. The i-th subinterval is called as i-th bin. Consider the subinterval length is с = (b – а)/k, and the limit of the і-th bin is di = a + i*c. Then after the analysis of the whole signal sequence x(n) in the і-th bin we derive the number of j samples х(n), so that di-1 < х(n) < di. The 0-th bin for samples х(n) < а, and k+1-th bin for samples i>b < х(n) are exclusions. Here the brackets  means the rounded value. Deriving the index by the formula (1) a one is added to the i-th bin, i.e. to the array element М(і). Such a calculation is repeated for all data х(n). The selection of parameters а, b, k, in general, depends on hypothesis of the signal х(n) distribution, method of data sampling and N . Surely, the number of bins must be less than о√N , or than the number quantization levels of х(n). The parameters а, b, k are corrected after some estimating cycles of histogram deriving. The unit has the generic variables channels, dmin, which mean k, and а, drange, which is equal to b – а. If the signal х(n) is periodical one, then х(n+То) = х(n), where То is its period. The real signal х'(n) has the additional noise part q(n),, i.e. х'(n) = х(n) + q(n). The averaging unit Averager is described in the following model. where m(q(k)) is the mean value of the noise q(k), q'(k) is the averaged noise signal without its mean value. We see obviously that the averaging can decrease the noise level in the signal up to √N times. Due to this fact the averaging of the periodical signal is often used for the noise filtration. The serious conditions of this process are approaching to nil of the noise mean value and that the length of the accumulating array y(n), is equal to the х(n) signal period To . The network in the Fig.1 can be implemented as the test bench diagram in the Fig.2. This diagram is built using the Aldec ActiveHDL package. Fig. 3 illustrates signal, which is generated by the unit Gen, signal with added noise, and signal after 100 averaging cycles in the unit Averager. 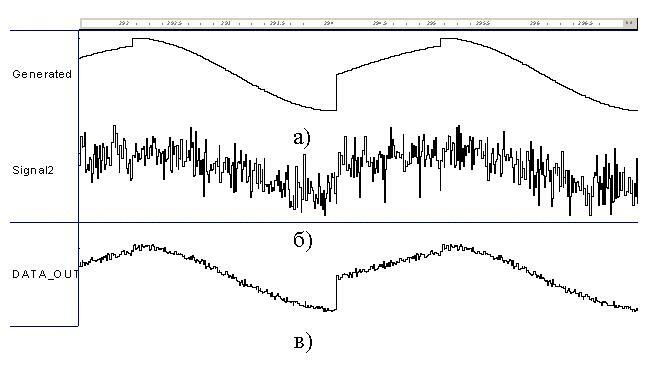 The analysis of the Fig.3 shows that after 100 averagings of the periodical signal the level of the added Gauss noise is really decreased in ca. 10 times. Fig.4 shows the diagrams of the output of the unit S_Distribut for the noise-free signal (Fig 3,a), signal with the added noise with the level 0.3, and level 3. The diagrams show that the signal has the positive mean value. The diagram Fig.4,a has the form, which characterizes the noise free signal, the diagram Fig.4,b shows that the noise is present in the signal. The diagram Fig.4,c shows that the noise level supersedes the signal level, and moreover, the noise has probably the Gauss distribution. Conclusions. It is shown here http://kanyevsky.kpi.ua/ru/%D1%81%D1%82%D0%B0%D1%82%D1%8C%D0%B8/vhdl-%D0%BF%D1%80%D0%BE%D1%82%D0%B8%D0%B2-matlab/ that VHDL language has the wide opportunities to solve the different modeling problems especially at the field of DSP.